General Fraud: Awaken citizens of India-If this is not anti-national activity, then what is? Awaken citizens of India-If this is not anti-national activity, then what is? The Supreme Court on Wednesday 12th August 2015, stayed the Madras High Court order cancelling former Telecom Minister Dayanidhi Maran's anticipatory bail. Justice T.S. Thakur also asked whether political vendetta was behind the push for Maran’s arrest. Although the Supreme Court has rapped the CBI on the bail issue, the gravity of this alleged crime should not be lightened in any way. The CBI has unfortunately probably not made a relevant and clear filing and this seems to have brought out the loss of Rs. 1.78 crores to exchequer as one of the main points of this case. A Cabinet Minister has executed BSNL ISDN Broadband connections and Leased Line Circuits, an illegal phone exchange, at his residence in a secretive way, diverted these to the Sun TV head office, no bills were raised, no payments were made. Doesnt this actually qualify for Anti-National activity? A National Minister who is expected to uphold the highest traditions of democracy, accountability and transparency carries an extra-ordinary clandestine operation with utter impunity and even the media has not made a big noise about it. It is as though it has not even occurred to the Minister that he needs to think about accountability. Why wouldnt it be improbable that a Minister who has not even concerned himself with the law of the land, national interests, his duty as a custodian, would have used these high speed lines for transmitting national secrets to the highest bidder or to other nations? Well what did he do with these high speed lines (installed secretly)? Surely he was not using it for browsing the net. Mind you, this was between 2004 and 2007 when most Indians struggled with even the best service provider. Wasnt it entirely possible that he was using these high speed lines (installed secretly), to transmit classified information in addition to Sun TV programs? Why is it that our great TV anchors who keep bawling and barking all day long at who ever they can find, over mostly trivial issues, have mostly stayed clear of this colossal fraud? Shouldnt the Supreme Court rap the Marans instead of taking up the issue of shoddy investigation and vendetta with the CBI? What is more important - that the case was at least brought up now and what more a better investigation can reveal on the extent and the size of the crime or the motives behind CBI at this stage? Why are people even highlighting the revenue loss? That is the last in the list of crimes committed here. That a Minister could even conceive installing a high speed exchange at his residence without the general knowledge of the administration is itself testimony to his devious intent. Diverting the lines to Sun TV from his residence - this guy probably still believes that they will come back to power soon and that the whole of India is his private property and any one and anything in India can be compromised for what ever his personal interests are. Shocking disbelief at the way such a major crime can be overcome by legal inadequacy on the part of the government. Complicity: Chief general managers of Chennai Telephones K Brahmadathan (2004-2006), M.P. Velusamy(2006-2007) booked as co-accused. MONEY-LAUNDERING CASE: Based on the CBI’s case findings in the Aircel-Maxis probe, the Enforcement Directorate opens investigation under the Prevention of Money Laundering Act. On April 2, 2015, the Directorate attaches Rs. 742.58 crore worth assets. The Central Bureau of Investigation has sought some more documents from Telecom Minister Dayanidhi Maran in connection with the alleged installation of an illegal phone exchange at his Chennai and Delhi residences in 2007. “Mr. Maran has not yet supplied all the papers required by us. During the questioning, he was evasive on many points and was not cooperating in the investigations. Therefore, the agency has sought cancellation of the anticipatory bail granted to him. We have asked him to provide the other relevant documents and will question him again soon,” said a CBI official. The CBI had earlier alleged that Mr. Maran was not being truthful in sharing facts about the installation of the illegal phone exchange. “While investigation revealed that he had got installed one pilot connection consisting of over 770 lines, Mr. Maran said he had only one connection,” said the official. Last month, the agency had questioned the former Telecom Minister for three consecutive days. “He was also questioned in January and October last year,” said the official. According to the CBI, 770 high-capacity BSNL lines at Mr. Maran’s three residences in Delhi and Chennai were used by Sun TV to uplink programmes, causing a loss of Rs.1.8 crore to the exchequer. The agency had earlier examined Mr. Maran’s brother Kalanidhi Maran last September. In January, it arrested three persons, including a close aide of the former Telecom Minister, for their alleged involvement in the case. The role of some BSNL officials is also being examined. Mr. Maran is facing charges that he had a mini-telephone exchange set up at his Chennai residence to provide 323 telephone lines to the offices of the Sun Network, owned by his brother Kalanithi. Chartered accountant and RSS ideologue S. Gurumurthy on Friday challenged former Union Minister Dayanidhi Maran for an open debate on the BSNL exchange case. He also questioned why Mr. Dayanidhi Maran called for an early morning press meet and informed journalists just a couple of hours before. “I challenge him (Mr. Dayanidhi Maran) for a public debate. Let him prove himself there,” said Mr. Gurumurthy who was the first person to expose this issue in June 2011. “Why did he call for a meeting at a short notice and I also want to know why he has not filed defamation case against me till date,” he asked. 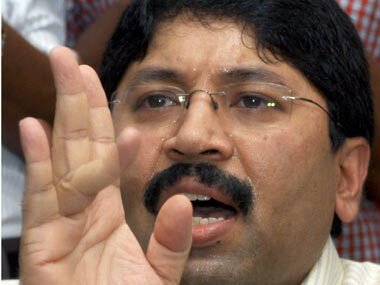 Mr. Dayanidhi Maran has been facing allegations that he had a mini-telephone exchange set up at his Boat Club residence in Chennai to provide 323 telephone lines at taxpayer’s expense to the offices of the Sun Network, owned by his elder brother Kalanithi Maran. Additionally, these lines were programmed in such a way that no one other than authorised BSNL staff were aware of its existence. A sample study, it is learnt, had estimated that 48, 72,027 units of calls had emanated from one telephone number 24371515 in the month of March 2007 alone, which is indicative of massive multimedia transfers through the connections. This, Mr. Gurumurthy said, was a great loss to BSNL. On Thursday morning, almost 12 hours after the CBI arrested three persons — V. Gowthaman, the then additional private secretary to Mr. Dayanidhi Maran; S. Kannan, Chief Technical Officer of Sun Network; and L.S. Ravi, an electrician at Sun Network — the former Union Minister called for a press meet. He even said that technically it was not possible to have these connections. Mr. Gurumurthy pointed out that the cables still existed. “The cables exist even now and he is lying that he has only one number. The evidence is physical in this case…,” he said.